Our Criterion Workforce Personality Questionnaire is an additional tool available, specifically designed to assess personality areas recognised as important in blue collar, production and manufacturing roles. 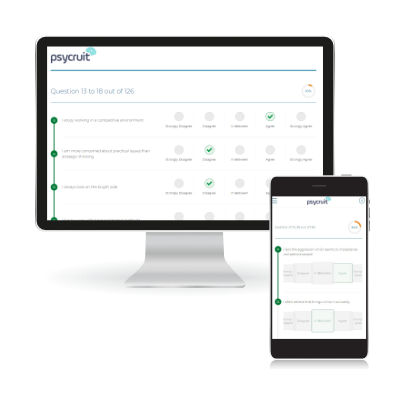 Psycruit personality questionnaires are built to be flexible. This means you can quickly and effortlessly create your own personality questionnaire to tap into those traits you are looking for in your candidates. Tailor your questionnaire to fit your leadership model, values, or competency framework and then create it in a matter of minutes with our easy-to-use questionnaire builder. Pick any combination of the 46 scales available in the Criterion Attribute Library (CAL) to power your bespoke questionnaire and generate custom reports. Covering recruitment, selection and development purposes, our suite of reports explore in depth the individual’s personality profile and provide you with powerful insights into their tendencies and preferences at work.